World number ones Amr Shabana and Nicol David secured their third successive titles in Hong Kong with victories over the second seeds the finals of the Cathay Pacific Hong Kong Open Squash Championships. Shabana beat Australia's world champion David Palmer in the semi-finals of the men's $120,000 PSA Super Series Platinum event. And, after winning back-to-back titles over the past two weeks at the Saudi International and Qatar Classic, the 28-year-old from Cairo extended his winning streak to 15 matches with a 10-11 (1-3), 11-3, 11-6, 11-10 (3-1) victory in 61 minutes over Gregory Gaultier, the world No3 from France. "I'm very happy to win here in Hong Kong for the third time. 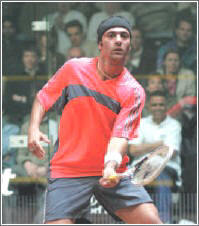 It was a tough match, Greg is a great player and he never gives up," Shabana said afterwards. "I'm very happy with the way I'm playing now, I think I'm at my peak, I just hope I carry on playing as good for the worlds later this month." Nicol David continued the form which she showed last week by winning the Qatar Classic in Doha - putting behind her the disappointment of a second round exit in the World Open in Madrid. The 24-year-old from Malaysia defeated England 'giant-killer' Vicky Botwright in the semi-finals - then stormed to a 9-3, 9-5, 10-8 win over Australian Tour rival Natalie Grinham in a 58-minute final. "It's just nice at the moment to be getting the results again," said David. "I've felt good all this week and last, and I just went in today to play my best. This is my last tournament of the year so I went in hoping for a good finish, especially after winning in Qatar last week. "Three-nil doesn't show how intense the match was, Natalie's a strong fighter, you just have to keep going and hope to get the win." England's Vicky Botwright produced the best performance of her career in the Cathay Pacific Hong Kong Open Squash Championships to beat Australia's recently-crowned World Open champion Rachael Grinham to claim a place in the semi-finals of the $89,000 women's WISPA Platinum event in Hong Kong. Defending champion Amr Shabana led the top four seeds through to the semi-finals of the men's $120,000 PSA Super Series Platinum championship. Botwright, the sixth seed from Manchester, fought back from a game down to defeat third seed Grinham, who is also the reigning British Open champion, 5-9, 9-6, 10-9, 9-4 in 58 minutes. The England number three now faces top seed Nicol David, the defending champion from Malaysia who defeated Jenny Duncalf, the No11 seed from England, 9-3, 9-2, 9-2. The standout match in the men's event saw second seed Gregory Gaultier, the British Open champion from France, taken the full distance by sixth seed Nick Matthew, the US Open champion from England, before clinching an 8-11, 11-4, 8-11, 11-2, 11-10 (2-0) victory in 80 minutes. Gaultier will face fellow Frenchman Thierry Lincou in the semi-finals after the fourth seed beat England's No7 seed Lee Beachill 11-8, 11-9, 11-4. The French pair go into their third Tour meeting this year, with honours shared. The only upset in the second round of the Cathay Pacific Hong Kong Open Squash Championships came in the women's event when England's Jenny Duncalf despatched former world champion Vanessa Atkinson, the No8 seed, to take an unexpected place in the quarter-finals of the $89,000 WISPA Platinum event. The top eight seeds secured their anticipated places in the last eight of the men's $120,000 PSA Super Series Platinum event, led by defending champion Amr Shabana with a straight games win over Malaysia's Ong Beng Hee. Jenny Duncalf, the No11 seed who celebrates her 25th birthday on Saturday, recovered from a game down to topple Atkinson 8-10, 9-4, 9-0, 9-1 in 44 minutes. The England international from Harrogate in Yorkshire will now face top seed Nicol David for a place in the semi-finals. Defending champion David, the world number one, defeated Dutch opponent Annelize Naude, the 16th seed, 9-5, 9-2, 9-4. With successive victories in last month's Saudi International and last week's Qatar Classic, Amr Shabana notched up his 12th successive PSA Tour match win when he beat 12th seed Ong Beng Hee 11-5, 11-6, 11-8 in 34 minutes to claim his quarter-final berth. The event favourite will now face compatriot Wael El Hindi, the No8 seed who ended Joey Barrington's run, beating the unseeded Englishman 11-8, 11-7, 10-11 (4-6), 11-9 in 96 minutes. Second seed Gregory Gaultier was taken the full distance by ninth seed Stewart Boswell before beating the Australian 10-11 (0-2), 11-4, 11-4, 10-11 (2-4), 11-5 in 72 minutes. England's Joey Barrington caused the only upset on the opening day of main draw action in the Cathay Pacific Hong Kong Open Squash Championships when he defeated Australia's 15th seed Cameron Pilley in the first round of the long-established men's $120,000 PSA Super Series Platinum event in Hong Kong. Qualifier Tenille Swartz earned a surprise berth in the last sixteen of the women's $89,000 WISPA Platinum event - but the 20-year-old South African was the lucky recipient of a walkover when Tania Bailey, the fourth seed from England, was advised to withdraw from the event by the England team physiotherapist, as the result of an adductor strain. True to form, Joey Barrington wore his Australian opponent down in a marathon encounter, beating the 25-year-old from New South Wales 6-11, 11-4, 11-6, 11-8 in 68 minutes. Barrington, the 27-year-old son of British squash legend Jonah Barrington, the six-time British Open champion, now goes on to face Egypt's Wael El Hindi for a place in the quarter-finals. The eighth seed from Giza - who is also coached by Barrington senior - defeated Frenchman Renan Lavigne 7-11, 11-4, 11-8, 11-6. Defending champion Amr Shabana enjoyed a comfortable 11-9, 11-6, 11-4 first round win over England's Alister Walker. The top seed from Egypt, who is bidding to win his third PSA Super Series Platinum title in as many weeks, will now face Malaysia's Ong Beng Hee after the 12th seed beat Dutch qualifier Dylan Bennett 11-7, 8-11, 11-9, 11-3. Favourite Nicol David earned the swiftest win in the women's event. The 24-year-old world number one despatched unseeded compatriot Tricia Chuah 9-4, 9-0, 9-0 in just 19 minutes. The defending champion, winner of last week's Qatar Classic in Doha, will now meet Dutch player Annelize Naude after the 16th seed beat Hong Kong qualifier Christina Mak 4-9, 9-0, 10-9, 9-5. Max Lee and Christina Mak delighted the local crowds at the Cathay Pacific Hong Kong Open Squash Championships after securing places in the main draw of the long-established World Tour event in Hong Kong. Lee became the lowest-ranked player to claim a place in the first round of the men's $120,000 PSA Super Series Platinum event when he defeated Mohd Ali Anwar Reda - fighting back from 1/2 down to beat the Egyptian 11-8, 2-11, 5-11, 11-6, 11-7 in 72 minutes. Lee will take on England's seventh seed Lee Beachill - while India's Saurav Ghosal earned his debut in the Super Series event when he beat South African Jesse Engelbrecht 11-5, 11-9, 11-5 in the qualifying finals. Gaurav, who lines up against Australia's world champion David Palmer, will be joined in the main draw by compatriot Ritwik Bhattacharya after the 28-year-old from New Delhi beat England's Chris Simpson 4-11, 11-10 (2-0), 11-7, 11-4. Christina Mak's 9-4, 9-2, 9-3 victory over South Africa's Adel Weir in the women's qualifying finals expands local interest in the $89,000 WISPA Platinum event to four players. Mak will meet Annelize Naude, the 16th seed from the Netherlands in the first round, while two Hong Kong compatriots Rebecca Chiu and Annie Au will face each other for a place in the second round.